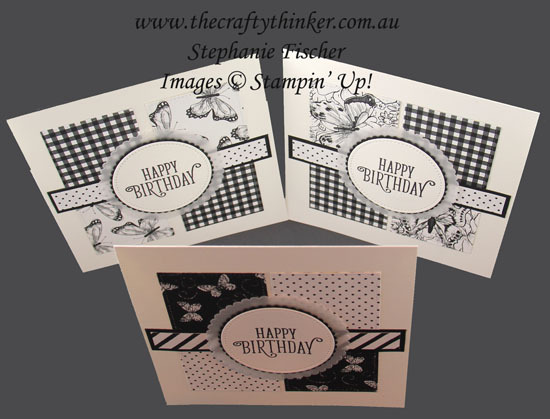 I originally made these cards for a Crazy Crafters' Blog Hop that, for one reason or another, has been postponed. So I've CASEd (Copy and Selectively Edit) this card by Connie Collins. I like this design because it's a beautiful showcase for some lovely Designer Series Paper - of which I have a lot at the moment! I've used up some of the gorgeous Botanical Butterfly paper (that I acquired FREE during Sale-A-Bration with a product purchase of $90!) and decided to go with classic black and white ... and it was so quick and easy that I made a trio! Like Connie, I used one of the Stitched Shapes dies to cut the squares of the paper but you you could use one of the Stitched Rectangle dies and trim it down or simply cut the squares with a trimmer. 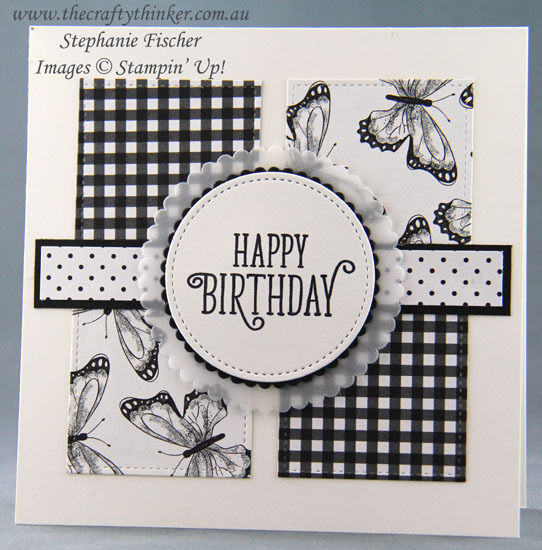 The base cards of Thick Whisper White cardstock are 5.75" square. The centre black strip measures 14cm x 2cm - yes, I'm sorry about the measurement switch. I tend to be a bit ambidexturous with imperial and metric! The patterned strip measures 13.5cm x 1.5cm. 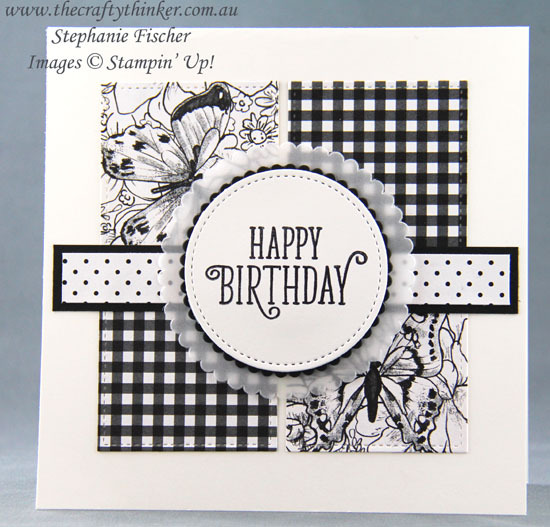 The greeting is from the Happy Birthday Gorgeous stamp set and I used one of the leftover bits of Thick Whisper White card. It's cut out with another of the Stitches Shapes dies to match the squares but you could easily use a Layering Circle die or a circle punch. 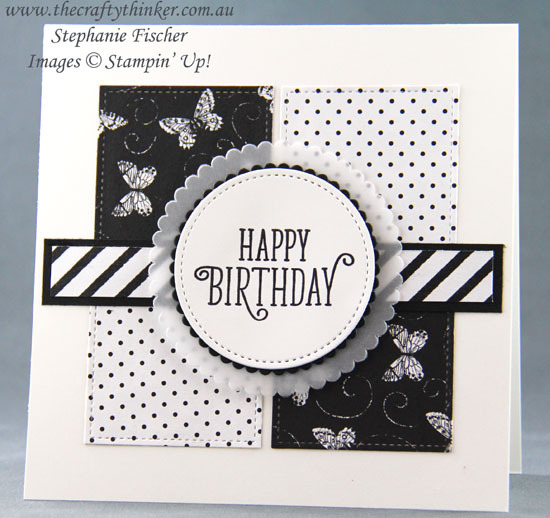 The black and vellum layers were cut with Layering Circle dies. For more information about how to get FREE products during Sale-A-Bration, click here.